Today we look at traditional fly sparging, batch sparging and no-sparge brewing techniques. Batch sparge techniques have become very popular with homebrewers recently, primarily because batch sparging requires less time and less equipment than traditional techniques at minimal added cost. Sparging (or lautering) is done at the end of the mash process, before the boil. 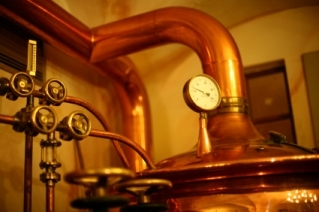 The purpose is to extract the sugars created by the mashing process and dissolve them into hot water to form wort. We will then take the sugary wort, add some hops, boil it and ferment it to make our favorite beverage: Beer. There are three techniques for sparging: the fly sparge, no sparge and batch sparge. Traditionally brewers use a fly sparge, where hot sparge water is continuously sprayed over the top of the mash tun to replace the hot wort as it is drained from the bottom of the mash tun. This gives a continuous flow, ideally with the flow in matching the flow out. Commercial brewers will monitor the specific gravity of the hot wort coming out of the mash tun and stop when it reaches approximately 1.010 to avoid off flavors and tannins associated with low wort concentration. Duplicating a traditional fly sparge at home does create some challenges for the homebrewer. One must have not only a method for spreading water continuously over the grain bed, but also constantly monitor the flow of the water into the mash tun to make sure the grains do not run dry or overflow. Also fly sparging is a slow process – requiring as much as 60-90 minutes in some cases. Two alternatives to fly sparging are the “no sparge” and “batch sparge” techniques. For these techniques a fixed amount of hot sparge water is added to the mash tun, the tun is gently stirred to assure even extraction for the batch, and then the entire mash tun is drained into the boiler, often at a fast rate (i.e. just open the spigot). The “no sparge” option uses a higher water to grain ratio when mashing and drains it all out in a single operation, while batch spargers use two or more sparge water additions, draining the mash tun empty each time. The downside of batch sparging is reduced brewhouse efficiency – since a significant amount of sugar will be left undissolved and be discarded with the grains rather than make its way into the wort. For example a homebrewer fly sparging might achieve 73% brewhouse efficiency while a batch sparger might only get 66% brewhouse efficiency. Homebrewers compensate by adding more grain and just take the hit on efficiency. For a commercial brewer the extra loss would be costly, but for the homebrewer making a 5 gallon batch of beer adding 1-2 pounds of extra grain (perhaps $2-4 in cost) is not significant. For most homebrewers, the extra few dollars of grain is a good trade off when compared to the extra time and equipment needed to do a proper fly sparge. Batch sparging also has the advantage of higher gravity for the runnings, which will rarely come even remotely close to the 1.010 limit mentioned earlier. An additional concern with batch sparging is that stirring the mash upsets the grain bed, allowing more tannins and grain bits to make it into the wort. To reduce this risk, some brewers use a hybrid batch sparge method where they add sparge water slowly to the top and avoid stirring or completely draining the mash tun. This hybrid method does require additional time for the water to flow through the grain bed – much like a traditional fly sparge. Batch sparging is more popular than no-sparge because it lets you use a traditional water to grain ratio when mashing, a smaller mash tun (typically a 5 gallon mash tun for a 5 gallon batch), and achieves much higher efficiency than no sparge options. If you have deadspace under the mash tun, you must also add that amount of extra water to the first batch. If you have the newest release of BeerSmith (V1.4 build 036 or above), you can get an optimal “equal runnings” batch sparge that duplicates the sparge water calculations described above by selecting any of the default batch sparge mash profiles. The batch sparge amounts needed are displayed using the brewsheet (Preview Brewsheet) for your recipe. The next item to consider is how much extra grain is required to use your batch sparge method. Unfortunately it is difficult to know this in advance, since your mash efficiency will depend on the milling of your grain, efficiency of your lautering system and other factors. A good rule of thumb is to add about 10% to your grain bill (or alternately take about 7% off your starting overall brewhouse efficiency of the recipe) for the first try. Some people use this “rule of thumb” method to size their batch sparge grain bill. If you use brewing software or a spreadsheet, you can calculate your overall brewhouse efficiency and use that number to properly size future batches. In BeerSmith, these calculations can be accessed from the “Brewhouse efficiency” button in the top section of any open recipe. This display your estimated overall efficiency and OG in the “Brewhouse Efficiency based on Target Volume” section. Enter your actual volume into the fermenter and measured OG into the dialog and the program will calculate your actual overall brewhouse efficiency which you can use for your next batch. After a few batch sparge trials you should have a good handle on what your brewhouse efficiency, and you can then use the “scale recipe” command to adjust web recipes to your personal brewhouse efficiency. Batch sparging is a great time-saving method for those who are not afraid of purchasing an extra pound or two of grain. Have fun with your batch sparging, and thanks again for taking the time to read this week’s article. Your comments, ideas and social bookmarks are always welcome. It would be nice it Beersmith would have a “Denny Conn” batch sparge option. This would add the top-up/mashout step that occurs before the first drain. I believe that’s what the new option does – it calculates the addition to the mash water for the first step that produces 50% of the target boil volume (addition plus non-absorbed mash water). Any advice on creating a mash profile that will do this? I agree – if you want to assure this you do need to measure and monitor the SG of the runoff. However for most batch sparge situations you rarely sparge below this limit unless brewing very low gravity beer. So is the temperature recommended for the sparge water addtions intended to be the temperature of the water only or the total temperature of the mash? I generally sparge with water at around 168F. If the sparge water is too hot it can extract unwanted tannins. A helpful article for someone about to do their first Batch Sparge All Grain. But it would be nice if you could use Pounds/Ounces for weight vice the Metric system and translate that information for the computations. I have never tried the no sparge. Does anyone have any advise on this? I’ve been using Beersmith since version one. I know there are other products out there but have no real interest in evaluating them. Beersmith has been a great tool that is packed with goodies. The better I got a creating good profiles and using the software the better beer has been coming out of the fermentors. One thing I have started doing with Beersmith’s fermentation profiles is making a profile for each yeast under different conditions. For example, I just brewed a blueberry beer and have created a fermentation profile for “forbidden fruit” (Wyeast 3463), early spring basement fermentation ( a had to abbreviate that but you get the idea). I plan on building a fermentation fridge as my next DIY project. If I use this yeast again in there, it will be called forbidden fruit controlled.” You can see some online profiles of yeasts at http://www.brewsupplies.com/wyeast_profiles.htm. One thing I would change at this point about Beersmith is, if I am planning to brew a quantity of beer that exceeds the limitations of my equipment, you automatically point that out on the Volumes tab by flagging the field with a red dot. I love that. It would be even better if it could be flagged me on the Design tab as well. I nearly botched a batch because I wasn’t paying attention to that and ended up improvising by doing a longer sparge and a smaller mash. It turned out ok I guess but I now pay closer attention to all the tabs. I see a newer version is coming out soon with some really nice features in addition to the features it already has. I am eagerly awaiting its arrival. I am a little confused. When batch sparging, should the sparging be done in two equal size batches, allowing them to steep for a short time before draining each batch completely. For example 2.5 gallons added, drain and repeat for a total of 5. I noticed when selecting the “Use equal batch sizes” and “Drain mash tun before sparging” options it gives me the following; “Sparge with two steps (1.75 gal, 4.52 gal) of 168 F water. Those two batches are not equal and does it really matter? If I have enough volume in the cooler mash tun could I do the sparging in one batch? I recently switched to Beer Smith. I am a Pro Mash holdout only because I have been using it since it came out in the 90’s and all my recipes are on there plus I didn’t want to get used to a new program. However, I made the switch and I really love it. Only thing that it lacks (and pro mash lacked in this area as well) is a mash profile for fly sparging. I can make it work for me but it would be nice if it were more compatable to fly sparging. Am I not looking in the right place? Unfortunately I purchased all my equipment before I knew of BeerSmith and am all set up for fly sparging. How do I compensate for it? What settings should I use? @Bill T: When you look at the formula how the two volumes (batch_1 and batch_2) are calculated you’ll see that the first (batch_1) is half of the the total volume minus the mash water (including the absorption by the grain) whereas the second (batch_2) is exactly half of the final pre-boil volume. Hence, the batch_1 will always be smaller than batch_2. I am a little confused by BeerSmith’s batch sparge calculation. My pre-boil volume is 7.5 gallons. I have 10.75 lbs of grain, mashing at 151 F.
All things accounted for (dead space: 0.5 gallons, grain absorption: 0.125 gallons/lb), I should add 1.3 gallons for the first batch, and 3.75 gallons for the second batch. However, BeerSmith is telling me to add 1.6 gallons and 4 gallons for the first and second batches, respectively. Both are increased by about a third of a gallon. Can anyone clarify the situation for me? Do you have the “Adjust mash vol for deadspace” checked in the Equipment profile? That might account for the extra volume. I usually like to figure out why something works the way it does. In this case the software accounts for variables which are important in understanding your system. For the mash, BeerSmith is using a ratio of 1.2 qts/lb and taking into account the deadspace. This is easy to verify, since my dead space is 0.5 gallons or 2 qts, then we have 12.9 qts that resulted from the calculation for the water/grain ratio. I am still confused about the batch sparge additions. I’ve confirmed the absorption used by BeerSmith is 0.12 gallons/lb-grain. This means 1.29 gallons are absorbed. However, BeerSmith is telling me to add 1.6 gallons. For the second batch it’s supposed to be very simple. Half of the pre-boil volume is 3.75 gallons. BeerSmith is telling me to add 4 gallons. My conclusion is that I’m simply missing a variable. Can anybody help? I double check Beersmith batch-sparge calculations with onebeer.net online batch sparge calculator. Just for piece of mind and this is what I used before I had Beersmith 2. Make sure to adjust for mash-tun dead space. After your first mash rest at 150-154 degrees F with the calculated mash in/ water volume: the first batch sparge addition just makes up for beginning volume lost due to grain absorption and dead space so when you run off you collect “X” volume of wort to the brew kettle according to your batch size. THIS FIRST BATCH SPARGE ADDITION MUST BE BOILING WATER OR VERY NEAR 112 DEGREES F WHEN ADDED TO THE MAIN MASH IN ORDER TO INCREASE THE TOTAL MASH TEMPERATURE AS CLOSE TO 168-170 DEGREES F AS POSSIBLE. Blend it in very well (then check the overall mash temperature, record in notes) and let the grain bed settle for 10 minutes then run-off this first volume into your brew kettle. I usually bring my total batch sparge water volume to a boil, turn off the heat to the hot liquor kettle. Make my first addition. Leave the lid off the hot liquor kettle and let the remaining 2nd hot water addition free fall to about 170-174 degrees F. An extra couple of degrees over 168 degrees F will make up for temperature loss during 2nd addition and dough in to your MT. You may have to adjust this water temperature up or down as needed with heat or cold water during the blending and 10 minute rest and first wort run off stage. After you have drained your mash tun into the BK add the remaining hot water addition or known as 2nd addition/run off to your mash tun at 170-174 degrees F. Blend in very well (take temperature reading) and let it rest for 10 minutes. Then drain the mash tun to the BK. If you followed the Batch Sparge calculation for water additions as scheduled you should have ended up with exactly your predicted (calculated) starting volume in the BK. If a little bit more don’t worry if less top up with additional plain water. Then start your boil and hop schedule. If you adjusted your mash ph correctly in the beginning mash water volume so as to hit 5.2 -5.4ph during the 1st 60 minute mash rest, your final volume in the kettle should be at 5.2-5.4ph. I adjust my total batch water volume ph to about 5.8-6ph for my Midwest water source depending on grains used. The buffering power of a batch sparge will not change the overall wort ph. So if you add 6ph water to batch sparge your 5.2-5.4ph mash your beginning volume before start of boil will end up at 5.2-5.4ph. An added benefit of batch sparging. I was thinking that you would need to add very hot water for batch sparging after the mash. I don’t see this info in BeerSmith (I just purchased recently). Perhaps I’m using the wrong setting. Today I am trying to add the remainder of the full water directly to the mash prior to draining. If doing batch sparge, draining prior to adding water – which profile should I use? If adding remaining water prior to draining – which profile should I use? Is there a pay for service (telephone) to get the software up and running. E.g. pay by the hour? I make 10 gallon batches. I use a 10 gal Gott cooler setup. Also, there is no mashout step. I thought it inluded a mashout unless you select a mash profile that specifically excludes it.